Come and enjoy the early sunshine with one of our morning classes. A perfect start to the day! 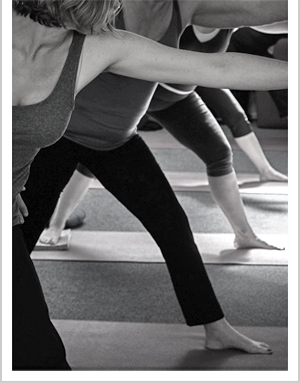 A liberating, free-spirited approach to Ashtanga Vinyasa and come away energized and inspired! Covering the top floor of a Georgian building this light, warm centre has large windows looking out over the trees and plants of Southernhay Gardens. Renowned for our welcoming and friendly atmosphere, our students range from complete beginners of all ages and abilities to more advanced yogis who have practised for years. We offer a variety of Yoga classes such as Hatha Yoga, Holistic, Ashtanga Short Forms, Vinyasa Flow, Anusara Inspired, Gentle Yoga, Beginners, Pregnancy and Iyengar as well as Pilates and Body Method classes. Our classes are taught by experienced teachers based in and around Exeter who will guide you through your practice, ease newcomers into a regular practice, consider recent or long-standing injuries to encourage you to work within the limits of your own body. We also have an exciting programme of workshops and courses for those looking to deepen their practice or try something new. The Lotus Loft yoga studio is fully equipped with mats, blocks, straps, bolsters and blankets for your comfort so all you need to do is wear something comfortable, bring an open mind and come and join us on the mat! Most of our classes are run as drop in so there is no need to book unless otherwise stated. The majority of classes are suitable for everyone including beginners unless marked on the schedule. If you are new to Yoga, remember even the most experienced student had the same experience of turning up nervous to their first class, our teachers will ensure you are comfortable, relaxed and made to feel welcome. Wear loose comfortable clothing, preferably in natural fibres; your temperature may vary throughout class so layers are recommended. Please arrive a minimum of five and a maximum of fifteen minutes before the class begins so as not to disturb others. We have a changing area and somewhere to leave your things and WC's so you can freshen up after class. Some teachers offer class packs, ask your teacher when you arrive for their payment options. Please ask your teacher any questions you might have and inform them of any changes to your health as it may still be possible to continue with your practice. They will offer modifications where necessary. Avoid eating a heavy meal prior to class and try not to eat anything for at least 1 1/2 hours before. If you are planning your first visit, please visit the 'contact' page for Lotus Loft directions and a photograph of our lovely Georgian Building so you can arrive in plenty of time. There is a brief health questionnaire to complete on your first visit. Jax Vessey is the founder of Lotus Loft, to read about her life with yoga click here. Please see the Schedule page for our full timetable of classes, prices and teacher contact details. Please visit the Yoga and Body Method page for more information on the various styles and schools of Yoga and other classes we offer. on 07989 409284 for more details. If you would like to sign up to receive the Lotus Loft newsletter, please click on the link below for regular information on all our classes and workshops.